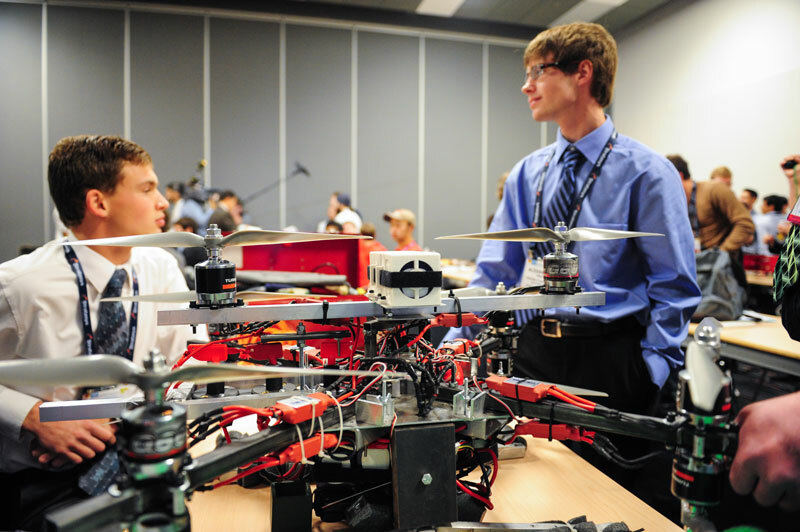 Eighteen teams of young engineers-in-training competed for the right to call themselves world champion drone builders at the 22nd annual ASME Student Design Competition (SDC) finals today at the International Mechanical Engineering Congress & Exhibition at Montreal’s Palais des Congrès. The international slate of teams – including squads from universities in China, France, India, Peru, Turkey and across the United States – brought their talent and training to bear on one of today’s hottest mechanical technologies: Unmanned Aerial Vehicles (UAVs) or as they are better known, drones. Each team had designed and built a powerful, maneuverable, remotely-piloted drone to fly in this year’s competition. Today, drones are one of the world’s hottest technologies. Though an industry still in its infancy, drones and their potential have captured the imaginations of leaders in business, government and academia. They promise new solutions for difficult, dangerous or time-critical tasks in industries from agriculture to emergency medicine, from energy to journalism and beyond. The SDC Challenge for 2014: design and build an original drone, pilot it successfully through a series of high and low obstacles, complete a targeted payload drop, and return to the start — in one piece. At day’s end, the University of North Dakota team took first place with their massive 78.4lb. gleaming steel-and-aluminum machine. Second place went to the nine-man, black-clad squad from California Polytechnic State University. Third place was taken by the “Airwolf,” the drone flown by the “Wolfpack” team from North Carolina State University. Every year, the SDC tests the mettle of young engineering students through a design-and-build challenge based on latest developments in industry and academia. A committee of ASME members led by Dr. Tim Hodges, Professor of Mechanical Engineering at the Virginia Military Institute, works throughout the year to bring the SDC to life. “Students get to use their engineering knowledge to design and build a vehicle, and then they get to compare their work with that of their peers,” Hodges said. “It gives them lots of confidence to work into the future and toward employment in the real world. And they have done such a wonderful job.” Wearing protective glasses and clutching clipboards, Hodges and his colleagues also served as judges of the competition. And a great day of competition it was: motors roared; assembled crowds hooted, laughed, and cheered; multicolored, multi-propellered flying robots swooped and zoomed high, loud and sometimes dangerously close to the competitors and judges in the arena. Judges’ papers were repeatedly blown away by the windy force of the machines in flight. And though many succeeded, several entries crashed and shattered, with carbon-fiber blades and aluminum struts flying in all directions.